Large 18" x 18" tiles cover large areas quickly, and can be customized in 3" increments to create unique lengths, widths and shapes. 7/8 " tiles provide structural support and impact absorption for healthier and more productive employees, even in multi-shift operations. Offers easy replacement of single tiles or sections as needed. This keeps replacement costs down. All styles of ErgoDeck® connect together, mix and match and create a wall-to-wall ErgoDeck® masterpiece. Positive Interlocking System Our 100% secure patented interlocking system prevents tiles from separating yet zips apart for reconfiguration. 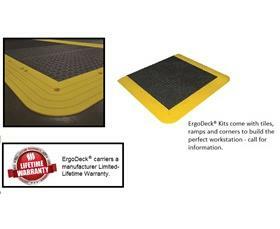 Universal Edging System The 6" wide safety ramps work on our entire line of ErgoDeck® tiles. 560-563 ErgoDeck® Heavy Duty is designed for work areas with heavy cart and foot traffic. The firmer compound lets carts roll with ease while the underside box-spring design provides structural support and impact absorption. The Open variation facilitates drainage with 15/16" holes. GRITSHIELD™ models add extra traction to tiles. 564, 566 ErgoDeck® General Purpose is designed for medium-duty work environments and features the best surface for work areas with foot and light cart traffic. The softer compound compresses more underfoot, delivering enhanced fatigue relief, while the box spring underside provides the necessary structure for rolling carts. 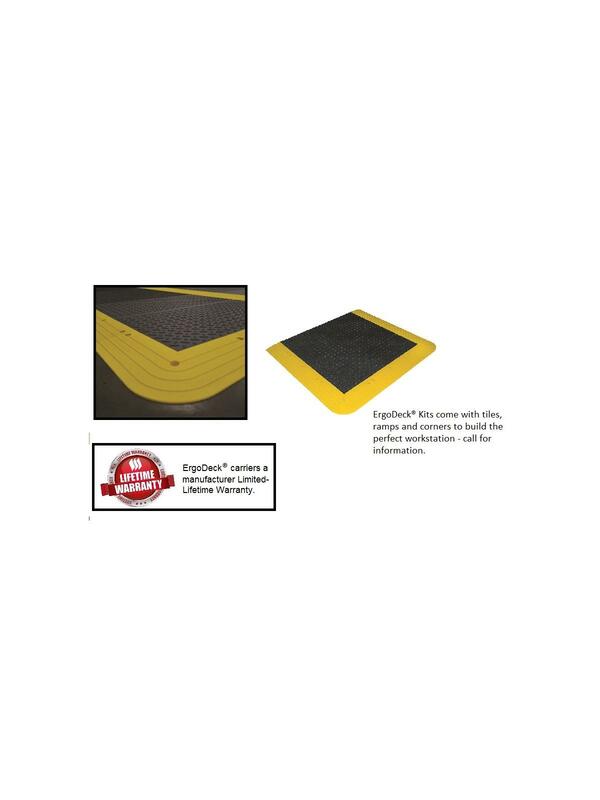 590 ErgoDeck® Diamond-Plate features the Heavy Duty and General Purpose tile rolled into one. The box- spring foundation compresses under foot providing anti-fatigue benefits and the necessary structure for rolling carts. The All-Star Diamond-Plate surface pattern provides traction and gives you the industrial look and facility needs. Choose the surface pattern, compound and color that suits your unique needs. Replace single tiles or sections as the work need changes. FOB Shipping Point. See Related Items tab for ErgoDeck® MAX and ErgoDeck® Ramps and Corners.